This weekend I had a chance to attend a wonderful seminar hosted at IISC Bangalore , titled ' Nanotechnology - Is your Business Ready" . Out of the 4 speakers who enlightened the audience, Dr. Rudra Pratap was the best speaker amongst all, as he spoke on the technology, the challenges and the future ahead in a very candid manner. What is Nanotechnology ? Nanotechnology is any technology which exploits phenomena and structures that can only occur at the nanometer scale, which is the scale of single atoms and small molecules. Why is it important NOW? Top down approach to manufacturing has been for years and has started reaching a stage where further miniaturization will not be possible. The most popular example that comes to one's mind is the CHIP where the number of transistors have been increasing at a tremendous pace and will hit a saturation point very soon. Is it similar to the IT Revolution? Many experts claim that Nano is the next industrial revolution in the offing.The fundamental difference between nanotechnology and older technologies is the approach. Nano is a bottoms up approach where you take atom by atom and subsequently build stuff. Like the IT Rev which was actually started with the semiconductor research in 1969 and is still continuing till date, Nano is in the initial stages where the businesses and commercial applications are expected to take off in 2025. What should India do to Ride the wave , this time around ? The biggest bottleneck in India is that most of the research that is taking place in nano , has NO Government / Private Initiative. Yes, Indian Govt has put in money , but according to Prof Rudra Pratap, it is 10 years late . This is the time when private equity funding should come in. Infact , if one looks at the Nano funding that is going on in US, most are private equity firms. Govt Funding was started in 1989 and the proportion of funding has come down considerably ? Does that mean India has missed the bus ? One of the highlights of the seminar was the model presented by Dr. Pratap on how must academia and corporate world work on creating and using nano for solving some specific Indian Problems. He said that academia should move out of citation driven life to more lead driven approach and go out of the way to encourage, excite the corporate entities for a) Infrastructure b) Risk capital c) Marketing efforts and buzz generation.The model suggested 4 to 5 lead research centers, 20 satellite centers, 50 feeder nodes and a trained manpower of 50,000 in 10 years. Ratio of expert to technician needed is 1:8. Some of the India specific nano products that would be needed are relating to Pharma sector, food packaging, sensors in auto ancillary parts, and nanoelectronics. Among a host of interesting questions from the audience , one of them was - "Professor, What should a student do in order to be prepared for this nano tsunami?, for which the reply came that , " It is all a matter of mindset. Nano involves exploiting material characteristics at a scale which we are not used to in normal life . Hence it is utmost important to start observing the nano world using an electron microscope, start appreciating the immense energy and activity that takes place in this world, and then start working to use it to our advantage"
In this regard, one of the speakers was mentioning the rather distressing situation of most of the engineering colleges in India not having an electron microscope. My biggest takeaway from the seminar was that, it is very important to get the timing right for any country to have leadership position in the technology , and in the case of nanotech, India is 10 years late than other countries...It is very important for the nation as a whole to catch up and ride the way, or else, we will be forever stamped as a service nation! The major areas of application right now are medical and pharmaceuticals, information technology, chemicals and advanced materials. However, if we look at this from an Indian perspective, textiles are far more significant.So the major applications would be in chemicals (better catalysts to improve throughput, the use of nano particles in composite materials) and textiles (to make cloth stain and crease resistant). Nanotechnology will also affect packaging. For an agriculturally rich nation like India, getting fresh food to outside markets in peak condition will be very a much a function of how it is packaged -- whether we are talking about 'smart' packaging, for example, the use of gas permeable layers that can expel undesirable gases such as oxygen while replacing it with nitrogen, or simply being able to detect a consignment of milk that has been left out on the sun en route to the supermarket. According to a recent study by Lux Research, North American companies spent $1.7 billion on nanotech research in 2004 and budget numbers in 2005 are on track to be higher. Even more impressive, 30% of the companies among the Dow Jones Industrial Average have announced nanotechnology partnerships, including names like DuPont, Volkswagen, Merck, and General Electric. 3M, renowned for product innovation, is on record as considering nanotechnology as having the biggest potential for their next blockbuster products. A major automotive R&D leader recently said that 30% of his R&D budget goes into manipulation of materials at the nanoscale. At some nano-application conferences, automotive products now constitute entire program tracks. Current market size = 580 Million - Expected to grow to 750 Million USD IN 2010. Nanotechnologists use three kinds of instruments to experiment with matter on the nanometer scale. Inspection tools such as atomic force microscopes and electron microscopes visualize nanometer-sized objects and represent the most mature and widely used category of tools for emerging nanotechnology. Fabrication tools such as nano-imprint lithography and dip-pen nanolithography create structures at the nanometer scale. Modeling tools are programs that predict nano-structure properties to circumvent the costs and time associated with experiments. The current market for nanotechnology tools is dominated by inspection tools, which accounted for 95 percent of the 2004 revenues. The inspection-tools market saw dramatic growth during the early 2000s nanotech explosion. Lux Research sees nano-imprint lithography as the favorite, which acts much like a miniaturized rubber stamp to lay out features as fine as tens of nanometers on surfaces. Modeling tools claimed less than $10 million in 2004 in the face of entrenched skepticism from potential customers. In five years Lux Research expected that market to expand to only roughly $40 million, a small fraction of the total nanotechnology-tools market. Still, in a decade the analysts predicted it could break $100 million as power, accuracy and ease of use of modeling tools continues to improve and more customer success stories emerge. 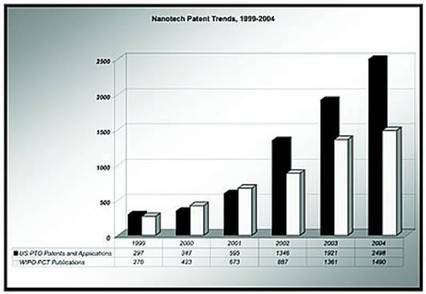 Nanotech patents that have been issued has grown from a measly 45 in 1999 & 180 in 2001 TO 2500 in 2004.One of the reasons for the rise is that a number of folks are attaching nano to a lot of processes and applying for patents. To clarify the patent definition, US PTO announced it had created a new classification for nanotechnology patents. US PTO announced it had created a new classification for nanotechnology patents. Classification 977 includes only those patents 1) whose subject matter is in the scale of approximately 1-100 nanometers in at least one dimension; and 2) that involve materials, structures, devices or systems that have novel properties and functions because of their nanoscale size. When the software industry was beginning to explode, there was a need of design language so that designers and programming community can talk to each other. UML was the answer and many companies reaped gold in coming up with tools to support UML. These are the times when Nano is the buzz word and its no surprise to see a tool for specifying designs in the Nano World. I guess this is just the beginning of tool deluge that will hit the market in the years to come. Mike Treder , the director of CRN says that Nanotechnology is on a upward curve and it might not be obvious to a lot of people, at this point of time. The problem is human perspective, what Ray Kurzweil calls the “Intuitive Linear View.” When we see something that looks like a straight line, we naturally assume that it is. Although change occurs around us every day, unless we look closely we may not notice it. So, we logically think that last week, last month, and last year were like today, and that next year and a few years after that won’t be much different either. It makes a lot of sense to be prepared for this upward curve and capitalize on the same. The report from Lux research gives a classification of the three thousand odd patents that were submitted in Nanotech. * Dendrimers pose the biggest question mark, scoring low on white space and freedom from entanglement for all commercially significant applications. A large number of relevant claims have been assigned from pioneer Dow to one start-up company, Dendritic Nanotechnologies. * Quantum dots have particularly knotty entanglement for general claims that cover the materials themselves and not any specific application. This fact casts doubt on the commercial value of quantum dot IP. * Carbon nanotube patents look messy in electronics, but promising in energy and healthcare and cosmetics. The common assumption that carbon nanotube patents are both numerous and overlapping across all important application categories is incorrect. * Fullerenes look relatively unentangled, but crowded with abandoned patents. The good news: Fullerenes show less entanglement than the previous three categories. The bad news: Many patents issued may be useless -- inventors have given up on a third of them by failing to pay patent maintenance fees. * Nanowire patents number few and seem distinct -- but Nanosys looms large. Nanowire patents offer a good opportunity to license the most important ones on an exclusive basis without worrying about IP entanglement -- so good that start-up Nanosys has already attempted to do it.